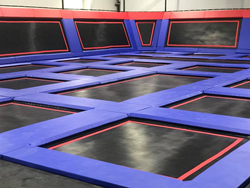 The Outer Banks of North Carolina will soon add a family centric trampoline park to the expansive list of activities locals and tourist can enjoy. What really solidified my decision to open a trampoline park was seeing my five-year-old son’s face light up like he was at Disney Land when we went to our first park. After speaking with industry experts and researching the trampoline park industry Brent decided a visit to a trampoline park with his three children was required. The positive experience he had at the entertainment center coupled with the excitement on his kids faces when they entered the park convinced Brent that the Outer Bank’s needed a trampoline entertainment center. Jumpmasters Trampoline Park is located at 728 US Highway 64 in Manteo, North Carolina. They will be announcing special promotions and events on their social media pages and encourage parkgoers to complete the online waiver required to enjoy the park in advance.